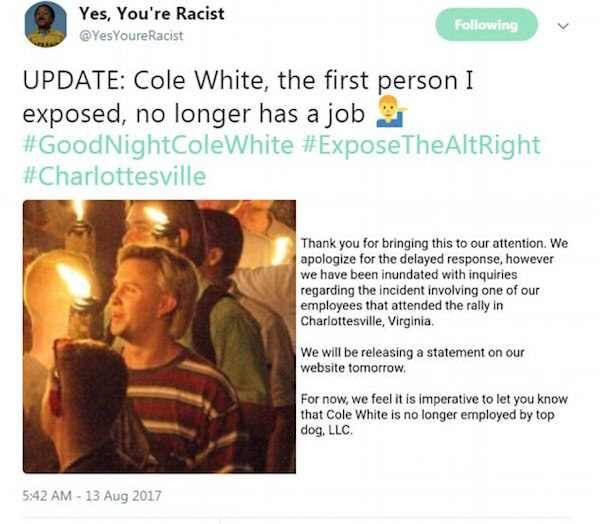 A white nationalist was fired from his job after Twitter users began naming and shaming alt-right supporters involved in yesterday’s deadly Charlottesville rally. The rally – which was described by the Southern Poverty Law Center as ‘the largest hate-gathering of its kind in decades in the United States’ – attracted thousands from neo-Nazi groups, the Ku Klux Klan and other far-right organizations. 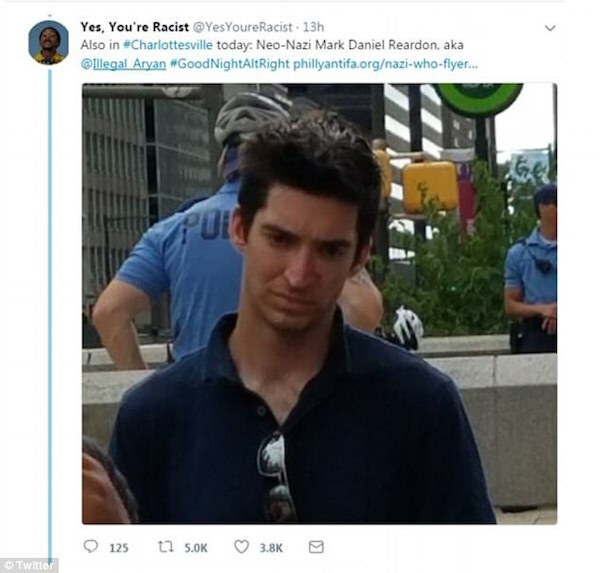 It also culminated in a horrifying alleged attack on a group of antifascist counter-protesters as alleged white supremacist James Alex Fields Jr allegedly drove into a crowd, killing one person and injuring 19 more. As the reverberations of that deadly assault continued to be felt on Sunday, Twitter user Yes, You’re Racist began naming and shaming those who were photographed waving torches and allying themselves with violent far-right extremists. 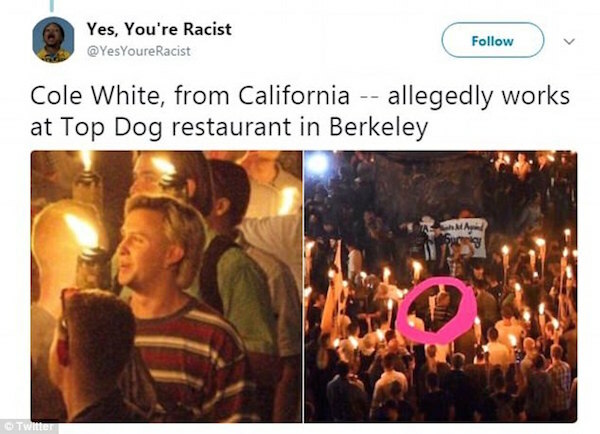 The first of those was Cole White, who has now been fired by Berkeley’s Top Dog restaurant as a result. A spokesman told reporters inquiring about White that they would be releasing a full statement tomorrow, but that ‘for now, we feel it is imperative to let you know that Cole White is no longer employed by Top Dog, LLC’. An employee at Top Dog confirmed to DailyMail.com that White had been fired. White was one of thousands who gathered for the Unite the Right rally in Charlottesville on Saturday – and one of many identified online. The event, which was openly attended neo-Nazis and other hate groups, was ostensibly intended to protest the planned removal of a statue of Confederate general Robert E Lee from the newly renamed Emancipation Park. The park – formerly the Lee Park – became a focal point for right-wingers of all kinds, from gun rights activists to alt-right members, to out-and-out fascists. Now some of those at the event are – like White – being targeted by online vigilantes who are using photographs from the event to try and identify them. 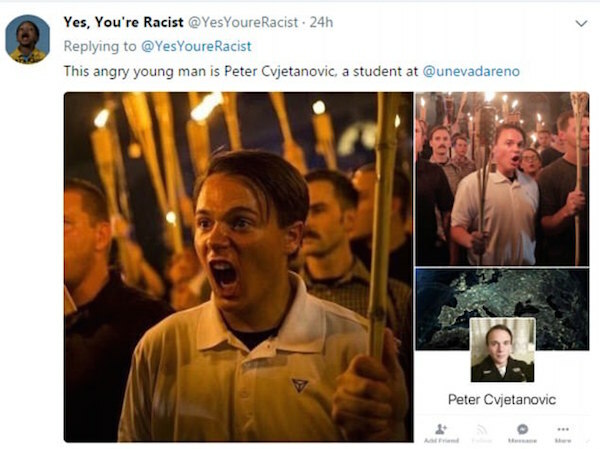 Another person identified by Yes, You’re Racist is Peter Cvjetanovic, 20, of Reno. He was said to be the angry-looking torchbearer who marched through the University of Virginia on Friday night as part of the rally. The student, an undergraduate studying history and political science, told KTVN he had traveled to the march ‘for the message that white European culture has a right to be here just like every other culture’. ‘It is not perfect; there are flaws to it, of course. However I do believe that the replacement of the statue will be the slow replacement of white heritage within the United States and the people who fought and defended and built their homeland. The efforts to hit out at far-right supporters have likely been spurred on by the intense coverage surrounding Fields’ alleged attempt to run over an entire crowd of counter-protesters. Adding to the fury felt by those on the left was what was seen as Donald Trump’s mealy-mouthed response to the fatal crash. The president – who has a substantial far-right following, and was openly supported by the Ku Klux Klan, among others, during the election – spoke out after the incident. The repetition of ‘many sides’ led to some, including neo-Nazi website The Daily Stormer, saying that Trump was blaming the antifascist victims as much as the white supremacist attacker in an effort to avoid condemning far-right extremists. 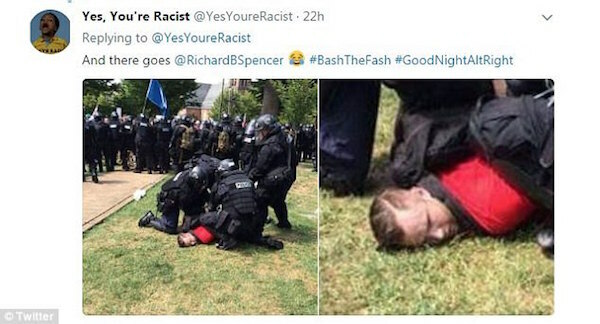 Others identified by the Twitter account include more well known names on the alt-right scene such as Richard B Spencer, co-editor of AltRight.com who was pictured being arrested by several police after the rally turned violent. 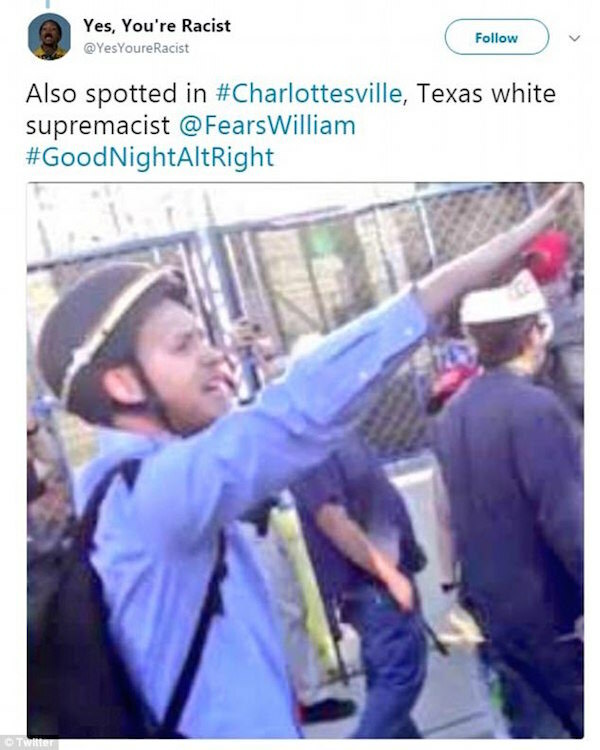 A Twitter user, by the username @FearsWilliam, who describes himself in his bio as being the ‘charismatic leader of a white breeding cult’, was spotted doing the Nazi salute at the rally – and even retweeted the photo which identified him at the rally. 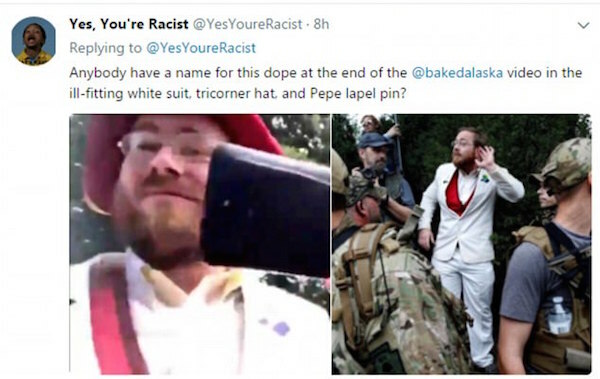 Others at the rally included Tim ‘Treadstone’ Gionet, aka Baked Alaska, a right wing internet troll who was reportedly maced during the protests. 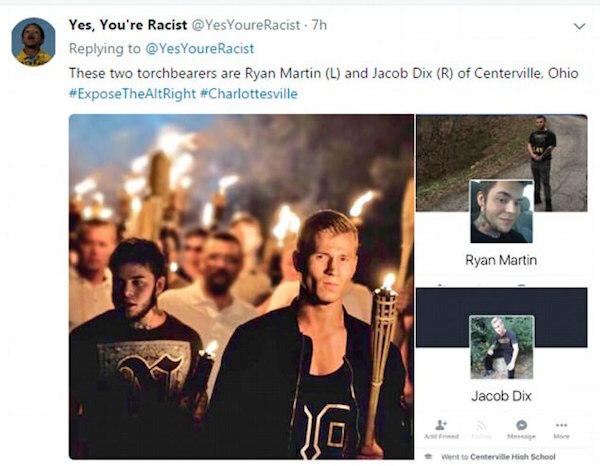 His friend, Twitter user @millennial_matt, was also spotted holding a flaming torch during the march on Friday. Fellow nationalist pal Mark Daniel Reardon also made an appearance at the rally. In the wake of the violence seen at Unite the Right, protests sprang up at events all over the US. Many were rallies in solidarity with those hurt and killed in Charlottesville, and protests against the Trump administration. There were also rallies by rightwing groups, most notably in Seattle, where a pro-Trump event was hosted in Westlake Park. Those events bred in turn counter-protests that attracted far-right and antifascist campaigners, respectively. There were few instances of outright violence, but tempers flared during a confrontation between antifascist counter-protesters and police in Seattle, resulting in at least one person being arrested. The friction emerged when police blocked antifascist groups from advancing on Westlake Park to confront the pro-Trump group. Antifascist members sprayed Silly String on police before apparently charging them – leading to a brief scuffle before the police line was restored. Police were filmed using pepper spray and flashbang grenades on protesters.